Supplemental Nutrition Assistance Program (SNAP) is a federally funded program that offers nutrition assistance to millions of eligible, low-income individuals and families. The program is run by the US Department of Agriculture (USDA). If you live in this state and need to apply for a Montana EBT Card, then the information below shows you how to apply for food stamps in Montana. If you have additional questions or concerns about the Montana SNAP program or the EBT application process, please contact the Montana Human & Community Services Division for assistance. Who Is Eligible For The Montana SNAP Program? Please Read This Before You Apply For Snap Benefits. People who live together and buy food and prepare meals together are grouped as a household for SNAP. Husbands and wives, and children under age 22 living with their natural, adoptive or stepparents must be considered as one household. Household members that wish to be included must furnish or apply for a SSN. Call or visit your local Office of Public Assistance. Households with a combined monthly gross income and liquid resources less than the household's monthly rent (or mortgage) and utilities. 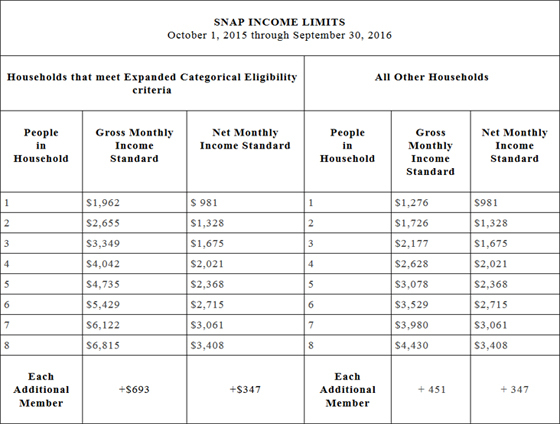 Income - Households who meet the gross and net income standards listed below may participate in SNAP. Households who meet the gross monthly income standard are then evaluated for the net monthly income standard after allowable deductions have been taken into consideration. Resources of individuals that meet the Expanded Categorical Eligibility criteria are excluded. If all members of your household meet Expanded Categorical Eligibility criteria all household resources will be excluded. In order to determine if members of your household meet this criteria please contact your local Office of Public Assistance. $2000 for all other households. The home you live in, vehicles, tax-preferred educational and retirement accounts, and combat-related military pay are excluded as resources. Households in which all household members are receiving Temporary Assistance for Needy Families (TANF) cash assistance, tribal TANF cash assistance, or Supplemental Security Income (SSI) are not subject to a resource limit.